First of all the graphics is dated and not AGA , the sound is very limited, and maybe thats why they released it for free on the cd32? , they just bundled it with cd32 gamer issue 7 (special 1) , i dont want to even complain as i was a big fan of Crazy cars 3 so im rather happy. It doesnt have any SAVE/pass methods wich is annoying, i will tell u why soon. So all of the point is really to win (OH? :D) and race like a crazy man in a fast car And you can place bettings with other people ,so if you win you might even get a bonus. This is one of the good/OK racers on the cd32 and its CHEAP (infact almost for free),and there is a reason for that,but id guess it wouldnt have hurted with AGA gfx and real cddasupport. If you have dried up of games,then u should give this title a try,as its really nice in many ways. 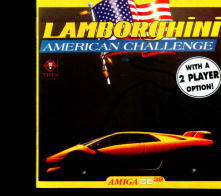 I cant give all the games a high score so thats why i love this game so much but still hate it abit also, but if you like oldskool drivers....then THIS is a game for YOU! ,as it have a nice twist!